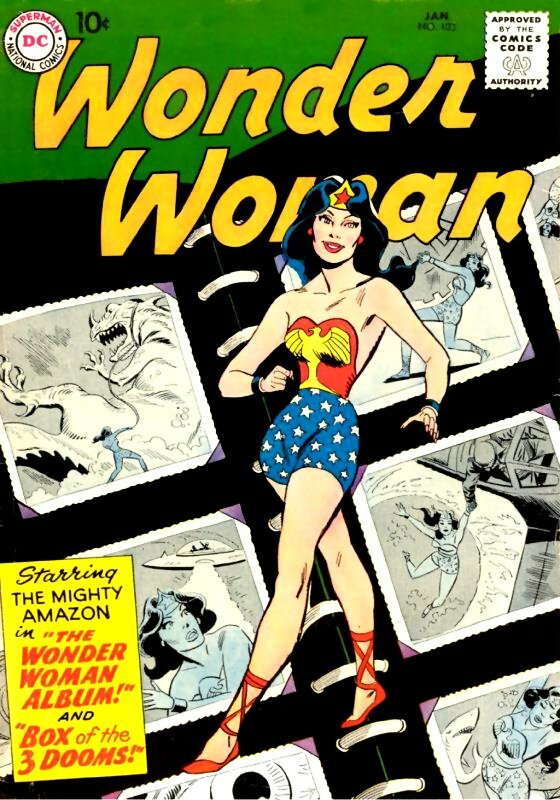 At the Amazonian Institute of Paradise Island, Tara — Wonder Woman’s official chronologist — shows a group of Amazonian women through the archives. When she pulls out the Wonder Woman album, the women take a look at the photos and find that they are all blank. 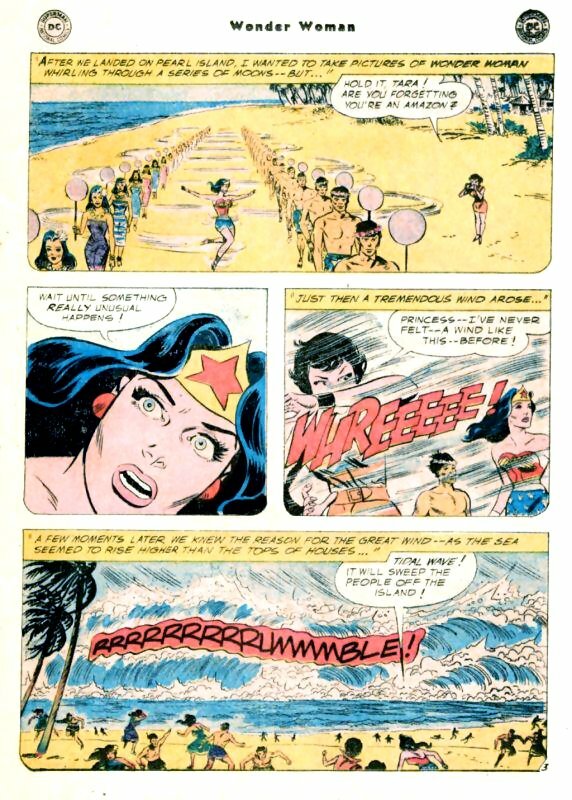 Looking at one marked “Wonder Woman vs the Tidal Wave”, Tara relates to a story not so long ago when Wonder Woman took her to Pearl Island to participate in a local ceremony when the island is threatened by a giant tidal wave. In this instance, Wonder Woman would quickly construct cover for the people of Pearl Island before the water hit. Initially trying to use trees, a coming wind would make this insufficient. She would dive into the water and pull out a chunk of coral reef to act as a break wall, fighting off a massive whale to get at it, saving the people of the island. With her recollection of the tale done, Tara explains that her camera got drenched, ruining the film inside. 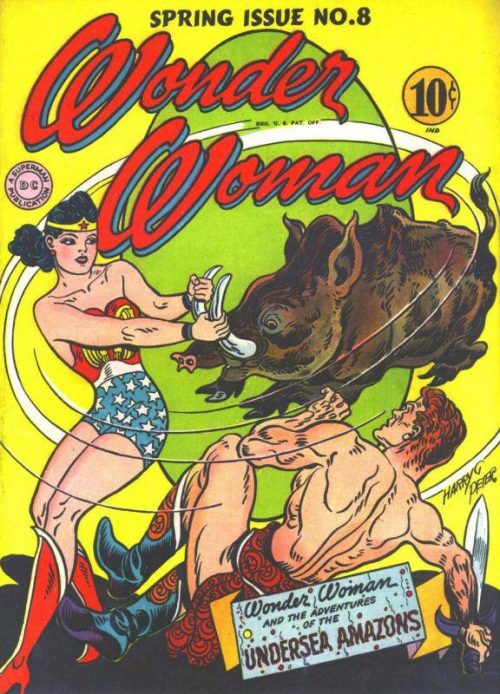 Accepting one error, they find the next photograph title “Wonder Woman vs the Giant Glacier” is also blank. Tara explains in this adventure, she accompanied Wonder Woman to the arctic to capture a picture of an amazing feat. After Wonder Woman’s battle with the polar bear that just wasn’t spectacular enough Tara would grow bored as nothing interesting would happen. When a tribe of locals are sent fleeing from the collapse of a glacier, this would give Wonder Woman the opportunity to perform an extraordinary feat. While Wonder Woman would succeed in stopping the glacier, the extreme cold would cause the shutter on Tara’s camera to frozen shut, making it impossible to take pictures. With this story done, the girls are surprised to find that Wonder Woman has put in a personal appearance. When the girls attempt to take her picture, Wonder Woman is suddenly called off to help a ship in distress. As she zooms off, the girls realise that getting a photograph of Wonder Woman is easier said than done as she moves too fast. A criminal known as the Gadget-Maker is seeking to come up with a means of destroying Wonder Woman and comes up with a specially made jewellery box he has titled the “Box of Doom”. Having it delivered to the office of Lt. Diana Prince with a note asking Prince to give it to Wonder Woman. 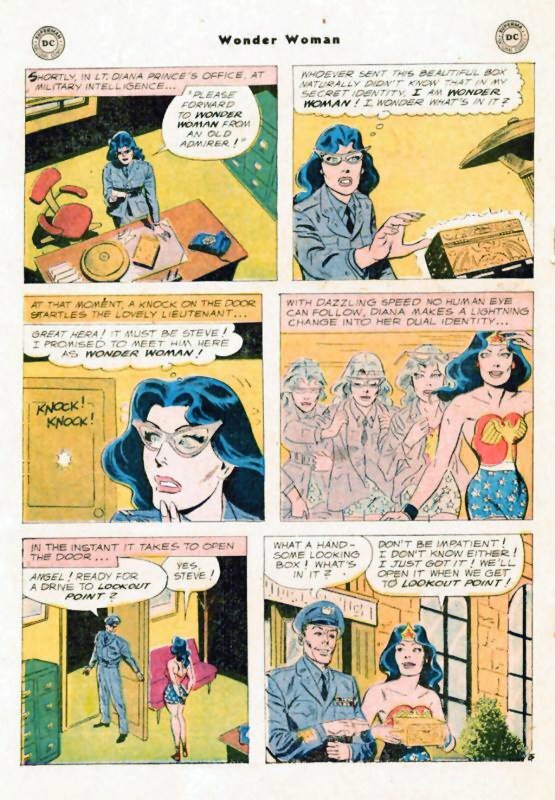 Wonder Woman, in her civilian guise wonders who the box could have come from and quickly changes into Wonder Woman before Steve Trevor can enter the room to take her out on a date to Lookout Point. When they arrive there, Steve convinces Wonder Woman to look and see what is inside the box. Inside she finds a small toy horse that suddenly grows to gigantic size. Reading a note attached, it asks her to ride the horse and so she and Steve hops on. As the horse suddenly races off, Wonder Woman over hears ticking coming inside from the mechanical wonder and realises it’s rigged with a bomb. 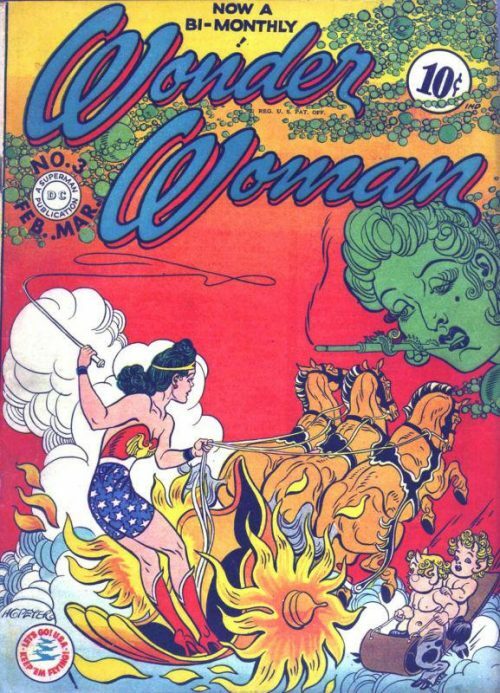 With the horse running down a busy highway, Wonder Woman must find a way to bring it somewhere it will safely detonate. Calling her robot plane, she pulls the horse up into the sky with her lasso. 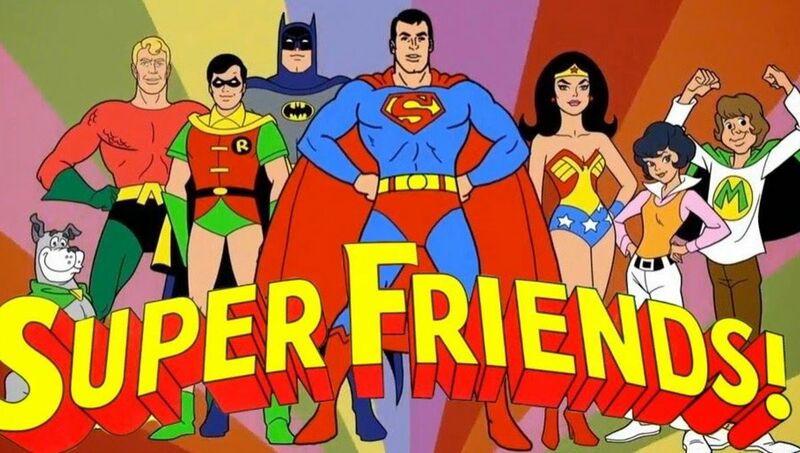 With her and Steve climbing aboard the invisible jet, the fly off into the sky where the horse harmlessly explodes. When she goes looking into the box once more, Wonder Woman pulls out a miniature eagle that also magnifies in size and attempts to attack her jet. 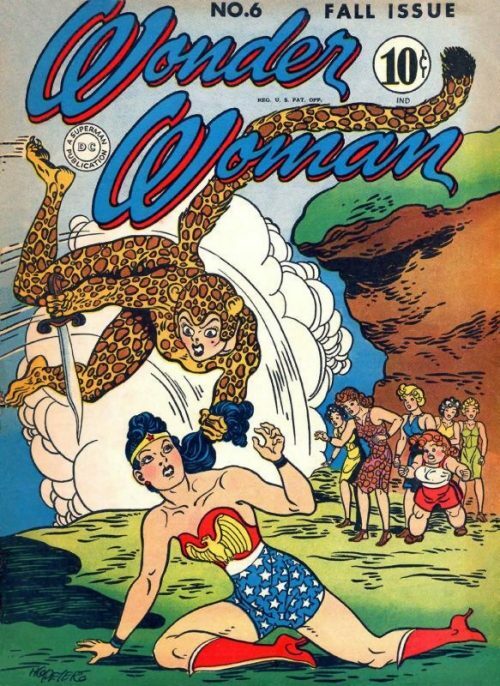 With some fast flying Wonder Woman manages to trick the creature to fly into the molten lava of an active volcano. The third item in the box turns out to be a shark which also grows to massive size. Diving into the ocean, Wonder Woman manages to trick the shark into being consumed by a giant clam. Considering how to capture the villain who sent her the box, both Wonder Woman and Steve deduce that if things pulled out of the box grow in size, then perhaps putting something into the box will cause that item to shrink. 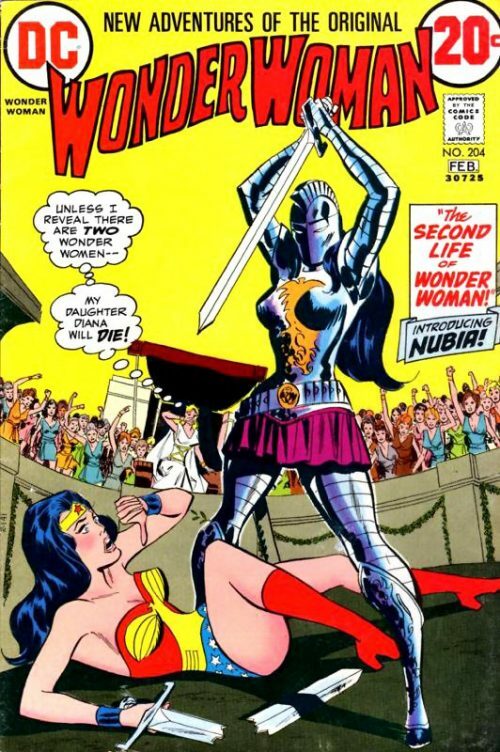 Wonder Woman decides to try this theory out on herself, and finds that his plot works. 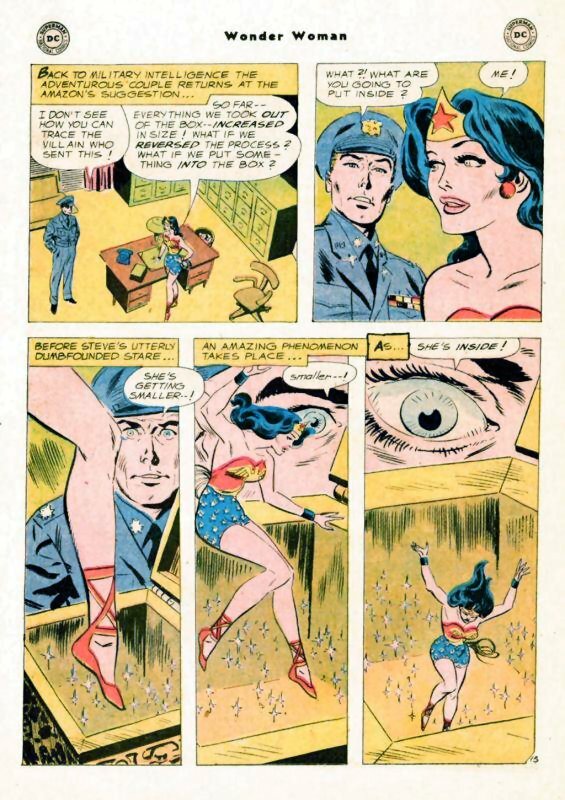 Shrinking down into size, Wonder Woman finds herself trapped in the box which suddenly flies out of the window. 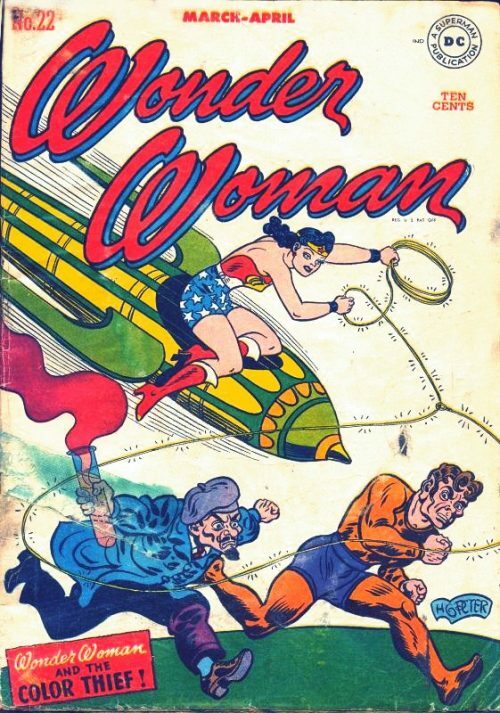 It takes her to the hideout of the Gadget-Maker who tries to grab the diminutive Wonder Woman, however she manages to rope up his hand with her lasso and escape the box, growing back to her original size. With the Gadget-Maker defeated, Wonder Woman turns him over to the authorities. Upon returning to military intelligence later, she is weary of yet another box waiting for her. But is relieved to find that it only contains a flower gifted to her by Steve.